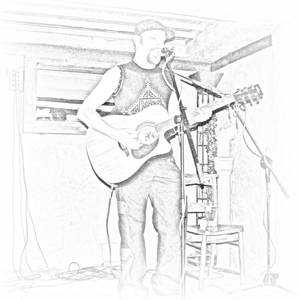 Brad is a singer, songwriter, and composter composer of chunky, often acoustic, music from Cambridge, England. Or as the chavs call it, Ingerland. It's a myth that I loves spreadsheets. It's a myth that I talks like Popeye the sailor. I just decided to write all this using the word "I" instead of the word "Brad" and couldn't be bothered to change the cojugation of all the verbs. When I think of spreadsheets, I think of the colour green. When I think of green I think of Salt and Vinegar crisps, and harken back to the days when the colour of Salt and Vinegar crisps was blue, so that Cheese and Onion crisps would be green. Which seemed a much more sensible colour choice to me. So, spreadsheets make me easily distracted. I bring to here my music, and these texts from the year 1901, as my music wasn't really going down well back then. The audience couldn't understand my English, and they don't know what a mobile phone is. So I took myself, my Drum & Guitar shop special guitar, and went into cryostasis, leaving instructions with a friend to wake me in a hundred years. She woke me in a hundred years. Use the links above to listen to some music, or even view the occasional moving picturograph. For a full explanation of what this all means, you can view the contents page.